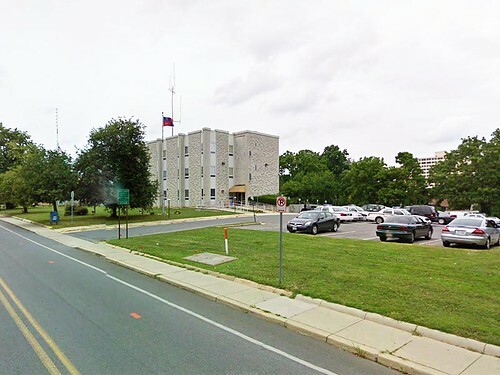 Next year, the Montgomery County Police Department's Third District station will move to a new facility in White Oak, leaving their current building at Sligo Avenue and Grove Street in Fenton Village. While some neighbors worried that the site would be redeveloped as housing, resident Karen Roper saw a chance to bring local artists together. The Third District police station today. Image from Google Street View. Roper, who lives in adjacent East Silver Spring and sits on the board of their civic association, has long been active in local affairs. When the police department announced their move in 2009, she began exploring ways to repurpose it with the help of her neighbors Steve Knight, his wife Karen Burditt, and Dan Morales, all architects. "I realized . . . that we needed to start earlier on getting behind things that we wanted," she says. "Knowing that the police station was going to move, I started talking to the neighbors around it." Many of those neighbors were artists who lacked space to work. "[They] have outgrown working in their attics or basements and they're ready to move to something bigger or more serious," says Knight. Roper worries that new development would make downtown Silver Spring "an audience district" by pushing them out. "We're an arts district that has no space for artists," says Roper. "East Silver Spring is full of artists. That's who we've always been." The Gateway Arts Center in Brentwood. Photo by Anne Marchand on Flickr. One of those artists, Laurie Breen, located her studio in the Gateway Arts Center in Brentwood, which opened two years ago in a former government surplus warehouse. Run by the Gateway Community Development Corporation and the Prince George's County Department of Parks and Recreation, the center holds classes, has two galleries, along with studios for 13 artists. Roper wants to create a place like that in Silver Spring. Her group envisions turning the 1960's-era police station into the Station Arts Center, a place where local artists can make and display their work and residents take classes. The parking lot in back would be turned into a community garden with 44 plots and "plenty of parking," while the front lawn would become an outdoor hangout like "the Turf," the temporary green that stood where Veterans Plaza is today. The station is located between downtown's high-rises and the porch-fronted bungalows of East Silver Spring, and both Roper and Knight refer to it as a good place for a "transition" or "buffer" between the two while reinforcing the community's character. A thousand units will be built in Fenton Village over the next few years, says Roper, but "there's no green space, there's no community gardens, and there's no space for artists." Knight and Burditt introduced the Station Arts Center concept in a column for the Silver Spring Voice. To "prove a need and a desire" for the project, the group is circulating a petition. Civic groups and the Silver Spring Citizens Advisory Board have also been receptive. "When I pitched the idea of an arts center and community garden, people loved it," Roper says, adding that David Dise, director of the county's Department of General Services, called it the "best proposal he'd ever heard for Silver Spring." Roper, Knight and Morales took a quick tour of the police station and found it wouldn't take much to turn it into an arts center. "I think you could go in there on Day 1 and have a fairly reasonable artist space," says Knight, noting that the building and its mechanical systems were in good repair, but could be reconfigured easily. "I don't think there's anything sacred [architecturally] about the building. It provides a pretty good blank slate to start with." There are also more unusual features, like an underground shooting range beneath the parking lot, which Roper says would make a "cool darkroom" for photographers. There are some issues, namely a lack of natural light. But "if the resources presented themselves," Knight says, "it wouldn't be really impinging the building's structural integrity if you wanted to punch some more windows into it." Roper's excited about the building's aesthetic qualities. "The police station is funky and square and 60's in look . . . it lends itself well to an arts center," she says. The Parks Department is "extremely enthusiastic" about the community garden, she adds, because the site is already publicly owned and fenced off, requiring little additional work. Knight notes that there was a "pretty positive response" to one at Fenton Street Park, two blocks away. Meanwhile, the lawn in front of the police station would become a "front yard" that Knight compares to "the Turf." It would be a "more casual outdoor space for people where you can just walk out, lay out a beach towel and get a tan." "We're not going to blanket the police station in Astroturf," he jokes. Though the design isn't finished, Roper estimates that it will cost $750,000 to renovate the police station. She is currently looking for a nonprofit group to operate the arts center, which would sustain itself by renting between 25 and 50 studios to working artists, offering classes to the public and some sort of "retail place." "All we need from the county is a short-term lease," says Roper. "We don't need any funds from them." Will the Station Arts Center plan work? We'll look at it in more detail tomorrow, along with one change I think could make it better. I appreciate the arts and community gardens as much as the next guy, but it's just such a large parcel...I'm salivating at the prospect of the small, junky 7-11 strip mall, neighboring animal hospital, and this police station parcel being combined for a great mixed-use redevelopment. it'd be such a huge boon for Fenton Village. The arts space idea is fine for the short term, but long term this parcel is an extremely important and unique opportunity...I really hope the county realizes that. That would be the ugliest and least inspiring arts center I have ever heard of. I have already written to the county to say that I think this is a bad idea. The only way to get a vibrant Fenton Village is to get more housing. I have nothing against finding an appropriate live/work space for artists, but this isn't it. Dan's article makes it sound like some of the artists wouldn't even live there. They are just people who live in the area.